When Lyft launched two years ago, it was a casual ride-sharing service where drivers used their own cars--nothing fancy, but nice enough--to give you a ride in the direction they were already heading. Because the rides looked like regular cars, drivers affixed hot pink mustaches to their bumpers. Lyft is now upping the ante with a higher-end Lyft Plus service offering luxury rides at higher prices. The pink felt mustache? Gone. 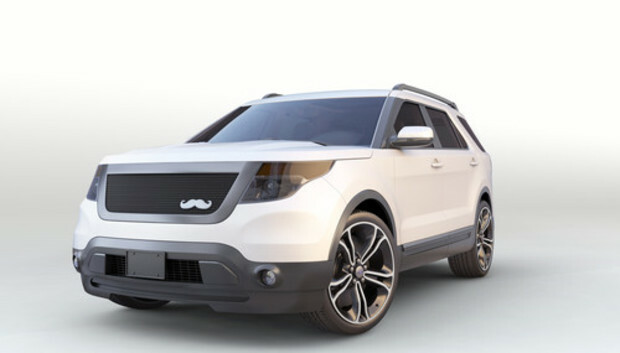 West Coast Customs (yes, of Pimp My Ride fame) designed a custom grille for Lyft Plus with an "elegant brushed steel mustache" to reflect the new service's mission: to provide a "fresh and modern transportation experience with lower prices and higher capacity than current premium options." Those current options include Uber's high-end cars for hire, which Lyft Plus is directly challenging. Its rates will cost 20 percent less than Uber Black and 40 percent less than UberSUV--though UberSUV's fleet includes Escalades while Lyft Plus is relying on six-seater Ford Explorers. The Explorers have been outfitted with LED lighting, quilted leather interiors, Spotify Premium playlists, and other amenities. Lyft isn't providing a fleet for its drivers--that would violate Lyft's sharing ethos. Instead, the company has offered up the customized Explorers to its highest-rated drivers to purchase at a discount. A handful of Lyft Plus vehicles are hitting the streets of San Francisco on Thursday, with more drivers and more passengers gaining access to the service as Lyft moves through the waitlist it opened last week. I haven't used Lyft Plus, but one of my early Lyft rides was in a Hummer customized with ambient lighting, gaming console, and a slew of other ridiculous amenities--and I have to say, it was pretty memorable. Lyft Plus is obviously designed to be an experience, and with limited availability, it probably won't detract from other high-end car services (at least not initially). But the launch of Lyft Plus is a clear shot at Uber, which has the luxury on-demand market cornered. With significantly lower prices than its competitor, Lyft Plus will surely draw its share of fans--though if you use Lyft because it's usually the cheapest option, Lyft Plus costs two times more. This isn't the first time Lyft and Uber have gone toe-to-toe. Uber launched as a premium car-hailing app, only last year rolling out the ride-sharing service UberX.